Bring the best of transitional style with help from the beautifully detailed landscape mirror. 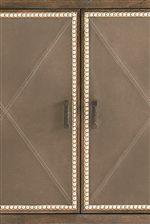 The beveled mirror, which can be mounted vertically or horizontally, features intricate molding on the frame. It will help bring more light into your room and create the illusion of more space. The Compass Rectangular Landscape Mirror with Wooden Frame by Bassett at AHFA in the area. Product availability may vary. Contact us for the most current availability on this product. 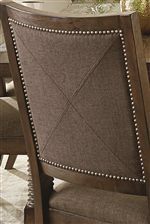 The Compass home collection offers designs and trends that work on both coasts and everywhere in between. 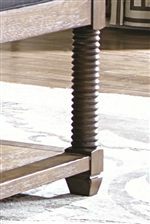 Its warm yet sophisticated style brings a softness to your home, with help from antique pewter hardware and knotty oak veneer. Beautiful turned legs and block feet are on select pieces, like the dining table and bed bench, and play into transitional style elements you'll love. 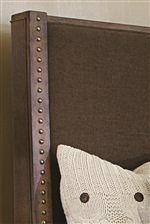 The muted Western Brown finish offers an inviting and laid-back appeal, while gorgeous accents like the upholstered bed's nailhead trim creates a subtle, dramatic flare.. Bring the Compass collection home to steer your life in a comfortable, soft, and eye-catching direction. The Compass collection is a great option if you are looking for Industrial Transitional Casegoods and Upholstery in the area. Browse other items in the Compass collection from AHFA in the area.